Just when you thought the selfie phenomenon had died a death in 2016, along comes the most narcissistic nail-art trend yet. Why plaster your mug all over your Instagram feed when you can admire your beauty - natural and made up - on all of your ten digits all day, every day? Meet Dain Yoon - the visual illusion artist whose latest piece of work has turned her into somewhat of a viral sensation. 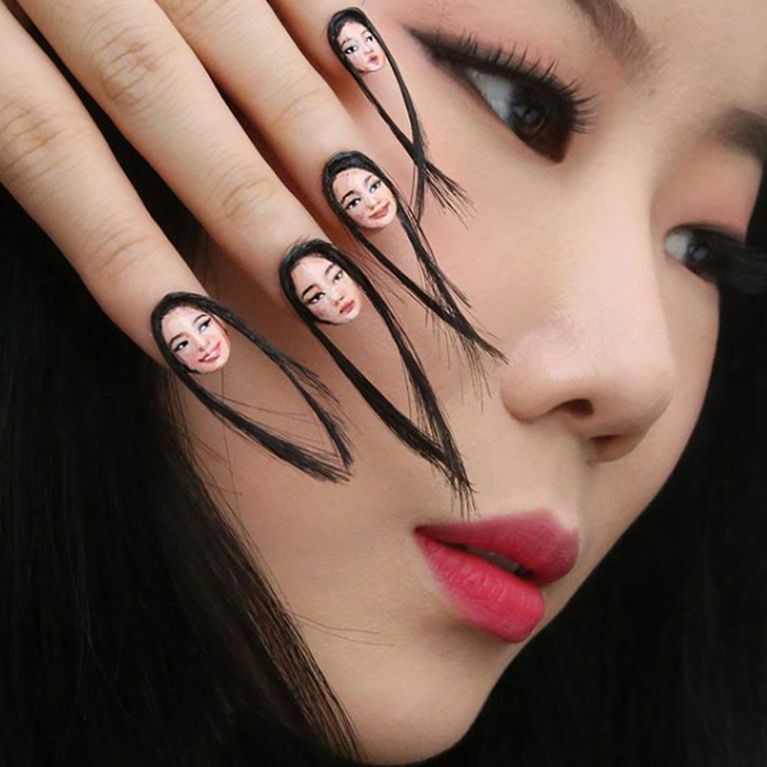 The South Korean artistic genius is making waves all over the world with her hairy selfie nail art which is quite possibly the most narcissistic beauty trend to date. Dain shared her latest offering on Instagram, single-handedly dividing users with her wacky reinvention of the classic manicure. The art form involved patiently painting her face - pulling all sorts of expressions - onto her nails and crafting longer nails out of hair, although it's unclear whether it's Dain's own. "Let my hair grow here #selfienailart 머리가 자란다 painted all by myself @designdain," she captioned a selfie showcasing the bizarre creation. Dain also shared a short video clip of her selfie nails in action, writing: "Say hi🖐🏻 to Dain1, Dain2, Dain3, Dain4... painted all by myself @designdain 🎨," alongside the post. While there's no denying Dain's creative genius, we're not convinced this type of nail art is all that practical and it seems the people of Instagram are equally confused. "Aaahahahahahahahha I don't even know what I'm feeling anymore," one user wrote while another commented: "I'm not sure why that's so gross but it is!"